Before Square Enix/United Front Games' open-world kung-fu game, the most recent exciting game was Spec Ops: The Line. And not even everyone was 100% in love with that. Sleeping Dogs came just in time to stir up the doldrums. It had been awhile since I was this excited to sit down with a game, and Sleeping Dogs lived up to the hype I gave it. If you were to take all the action drama from Hong Kong kung fu cinema and shove it into an open-world game, you'd get Sleeping Dogs. The game throws you into a beautiful, sprawling city. Street vendors call out to you, and thugs try to pull you out of your car. Citizens on the sidewalk will ask you for your help. Even the crummy apartment you start off with is surrounded by what seems to be prostitutes discussing the previous evening's...appointments. Hong Kong is alive, and you're thrown right into it. There's so much charm in this city that's simultaneously colorful, large, and full of life. I felt like a tourist, navigating the many streets, highways and alleys while being introduced to the communities of people living in the city. I started the game in awe of my surroundings, an experience that slowly gave way to expertise over what begins to feel like my city. Characters more integral to the storyline are just as charming as the city they dwell in. I especially loved my shifu, or my kung fu master. To learn new moves from him, you have to return his statues, left around the city. When you've picked a move you want to learn, he yells the most hilarious insults at you as you train. "Are you trying to embarrass me, or am I collateral damage?" "Ah, a disciple of the school of Never Winning!" He's amazing. Before I really start gushing about the little details that delighted me (did I already do that?) let's get back to what this game is even about. WHY: Sleeping Dogs is both great at making a beautiful Hong Kong your playground, as well as portraying the drama hidden in its streets. What I played: 15 hours to finish the campaign and a chunky handful of side quests, as well as fooling around in the open-world. The storyline is completely compelling, as are the characters. I haven't experienced such a detailed, dramatic and believable storyline in quite some time. Wei Shen is not just a fighter, he's a weapon. And it's incredibly fun to use him against your enemies. Fidgety camera angle that tightens uncomfortably in small spaces. Side missions are more distractions and an avenue to unlock the cooler cars than anything else. As an undercover cop attempting to infiltrate the Son On Yee under the guise of a foot soldier, protagonist Wei Shen's missions start off fairly brutally. You have to prove yourself by beating people up who owe your boss money. You're setting examples and establishing a reputation. You're a simple street thug, but boy do you have skills. 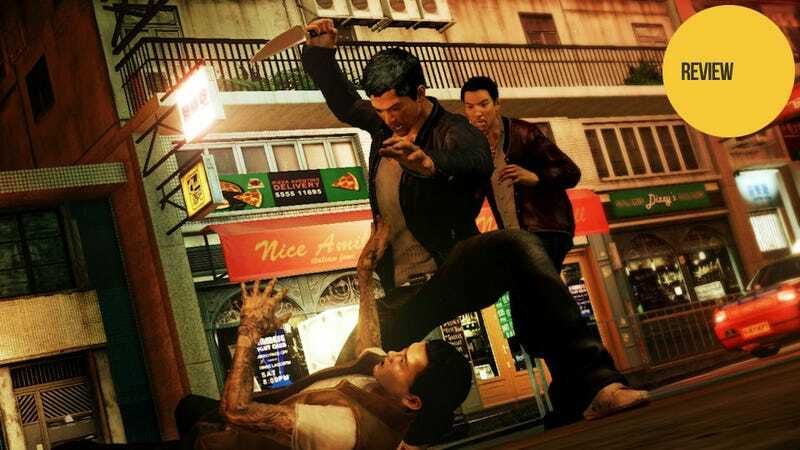 Sleeping Dogs emphasizes hand-to-hand combat over pistols and rifles (though those gunfights are still plentiful). You're an expert martial arts fighter and, as you train throughout the game, you'll learn more killer moves to stun your enemies or sweep them off their feet. Every move is satisfying, and the animation reinforces your kung fu expert motif. Rather than relying on big metal guns, you are the weapon. I felt more efficient tackling groups of enemies with my hand-to-hand skills than focusing on my hand-eye coordination in shooting. You'll learn how to roundhouse kick, and how to counter-attack dudes with deadly knives. Combat evolves in perfect harmony with the game, with your skills increasing in tandem with the threats posed against you. Combat is never filler; it's always thrilling. But this is an open-world game, so you can expect a fair amount of side missions and random activities to partake in in addition to all that. Everything from cockfighting, gambling and street racing to helping citizens out with random tasks and taking girls on dates. I wasn't so keen on these. While they often felt like an unobtrusive pit stop in between main missions, some of them required too much effort to be called a side mission. Drug busts, for instance, always require you to go back home to load up surveillance cams and seal the arrest. Considering you have a cellphone right in your pocket, pulling it up in the moment to finish the quest on that tinier screen would have motivated me to bust some more drug deals. I almost always avoided them because it felt like too many steps to carry out. The rest were sort of dull. Drive away from the cops. Deliver this package. Smash this guy's car, I hate him. I did enough smashing and driving on the main missions. Main mission smashing and driving was backed by motivation I cared more about, too. Side quests were short diversions, and ones that weren't particularly fun. And while taking girls out on dates made my girly side giggle, they were always short-lived and equally boring. Take pictures of this girl. Go on a jog with this one other. The most fun was racing around Hong Kong to make an impression. While I liked the characters of the ladies themselves, they were avenues that were never explored beyond a first date. Every date ended with my feeling that United Front Games missed a great opportunity to flesh out both Wei and his circle of acquaintances. The upside is that the more I interacted with strangers and ladies, the more Face I built. Though I didn't particularly enjoy all of the side missions you can pick up off the street, I did them anyway. Obviously one reason is because I need to experience every facet of the game to write this review for you. But Face is also necessary to purchase the swankiest cars and clothes. And I'm a sucker for looking sharp, even in a game. Fortunately it didn't take much more effort than to remember to spot the yellow markers on my map when moving from point A to point B. "Oh, hell, why not," I'd say. "I really want that Italian sports car anyway." Suits look real good on Wei, too. Fortunately, you don't necessarily have to complete any of these side quests. If you want to sing karaoke on your free time, feel free to stop by the bar to do so. But if you rather catch serial killers and human traffickers for your day job and combat the civil war going on in your triad by night, you can focus on walking that line instead. If I needed to boil down the experience of Sleeping Dogs as simply as possible, I have two overarching sentiments. One covers what's fun about the game. I loved every second of speeding through Hong Kong (destroying every driving lesson I've had by learning to drive on the wrong side of the road), punching people out in a well-choreographed fight, and feeling on top of the world as I continued to prove myself to the Sun On Yee. People knew my name. They called it out from the streets. My rivals feared me, and my crew looked up to me. "What do we do, Wei?" "Whatever you say, boss. We're following you." But I wasn't just given this status by the developer gods. When I started out, people spat insults and dirty looks at me. They accused me of being a pig (ironically enough). I had to earn their respect. And once I did, I fell into a place of command very naturally. My second biggest takeaway was the conflict. Sure, it starts off simply enough: undercover cop seems to be getting in too deep. He has a history with these criminals. He's going off the deep end! But, without spoiling anything, as you get further into the game you realize just how much you're struggling against. Wei reflects on everything he does. Sometimes he replays the things he's done in his head. The memories haunt him. He tries to do right by both his duty as a cop and his commitment to his brotherhood, but his conscience begins to catch up with him. More than that, the triad itself is torn by power struggles. Every day each sect of the Sun On Yee seems to have to watch over their back. No one trusts each other, and everyone is vying for a position of dominance. But there are even other struggles to being in the triad. Their "jobs" are so embedded in their lives that even wedding planning turns into a string of car chases, drive-bys, theft and more. It's a difficult lifestyle to survive, let alone maintain. Everyone seems to want to be a part of it, but it's only until they've been initiated that they realize what sacrifices they'll have to make. It's all a very fascinating look into a gangster's lifestyle, particularly one so shrouded by culture, tradition and an allegedly deep respect for family. The actors are all phenomenal, too. The writing is partially to credit. Dialogue is straight and to the point. Nothing felt like excess fat. Only certain—few and far between—moments felt cheesy. Otherwise, every interaction felt genuine and real. Adding to the power of dialogue was a good mixture of Cantonese and English. I think I even learned a few curse words in the process. I never felt completely lost in tracking subtitles, and it added authenticity to what already felt like a real Hong Kong experience. I can pinpoint the exact line that finally broke me. One of the very few issues with the game is a sort of annoying one: the camera. Oh, camera angles. Why does it seem like games that feel almost perfect are always handicapped by their camera? Sleeping Dogs joins the long list of really good action games saddled with a horrible camera. Some fights seem to hover too closely to your head, and if you're driving in reverse you can't fight the camera's instinct to look behind you. Sometimes I like to go in reverse without checking the rear, don't tell my dad. The camera issue is fortunately more tolerable when it goes awry in combat, because even while locked on to an enemy you can always kick in any direction you're being approached from. The fighting is, like I said, exhilarating. Nothing—not even a not-so-perfect camera—takes away from it. Since we're on the subject of where Sleeping Dogs falls short, let's get right to the remaining elephant in the room. While on infiltration missions, Wei needs to persuade people he's not a threat. He may be walking around with a gigantic knife in his hand, but in trying to be stealthy Wei needs to do some fast talking. I was hoping for personalized dialogue on the level of Deus Ex: Human Revolution where you can use your judgment to gauge what best approach to take conversations. Unfortunately it's less like fast talking and more like fast QTEing. A simple tap of Y will get past guards, monks, and whoever else you're trying to confuse. That's not to say having to press Y is a point off for Sleeping Dogs. In fact, I loved watching Wei charm his way past people. He definitely is a smooth talker, and thinks fast on his feet. I'm fine with sitting back and taking in more proof that I'm a badass. "Nothing stops you, you can do anything," is what the game is constantly showing me. Not just telling, but showing. Sleeping Dogs convinced me that I'm a supreme gangster. I'm a skilled kung fu artist, after all. I'm respected, too. When a high priority music producer rolls into town, my bosses boast that I kill the most efficiently out of everyone else. Who better to guide the newcomer on his night out in Hong Kong? And when said producer meets me, he is just as enamored by me as all my brothers in the triad. This open-world game makes all that feel very real. It's somewhat to do with how well I fight, and how tough I am. I hijack cars by jumping off motorcycles to land on them. I shoot out of speeding vehicles. I ram police cars off the road. I sweet talk all the ladies, and make them feel safe around me. Not only that, I'm a gentleman about it, too (for the most part). And when I fight, I smash people's faces into AC vents and meat grinders. I throw them off roofs. I chase them down alleys. There's nothing I won't do. There's nothing I can't do. Sleeping Dogs was an experience wholly unlike any other. Sure, it may feel like Grand Theft Auto, but with a focus on kung fu. It wouldn't be wrong to describe the game that way. But it is a narrow way to describe it. Because Sleeping Dogs is about so much more. It's about family, corruption, loyalty. It has the action of a Hong Kong kung fu film, but it has its heart, too. The danger is always palpable, and it always feels very real. Wei grows into a weird in-between life, balancing his duties as a cop with his duties as a brother to the triad. You can tell that he fights spiritedly for both sides, and you play out his internal struggle while observing every extra, outside struggle that claws its way into Wei's life.